Aerial photo of 2012 oil spill on the Red Deer River. Late Thursday evening on June 7, 2012, the Sundre Petroleum Operators Group, a not-for-profit society, notified Plains Midstream Canada of a major oil pipeline failure near Sundre, Alberta that spilled an early estimate of between 1,000 and 3,000 barrels of light sour crude oil (~159-477 cubic metres) into Jackson Creek, a tributary of the Red Deer River. The river is one of the province’s most important waterways, providing drinking water for thousands of Albertans. This recent spill occurred just weeks after another oil pipeline burst in Alberta in late May, spilling an estimated 22,000 barrels of oil and water (~3,497 cubic metres) across 4.3 hectares of muskeg in the northwest part of the province near Rainbow Lake. According to the Globe and Mail, this rupture, which occurred along a pipeline operated by Pace Oil & Gas, Ltd., “ranks among the largest in North America in recent years,” and certainly in the province of Alberta. A couple of weeks after the accident, the company downgraded the estimate to 5,000 barrels of sweet crude oil with no water (~795 cubic metres). These recent spills are considerably smaller in volume of liquid hydrocarbons released than last year’s 28,000 barrel (~4,452 cubic metres) spill on the Rainbow pipeline operated by Plains Midstream Canada near Little Buffalo, Alberta. While the 2011 Plains Midstream oil pipeline rupture may have been the largest single spill event in recent memory, the entire oil pipeline network in Alberta has spilled nearly equivalent volumes of liquid hydrocarbons every year since 2006. As my brief history of oil pipeline spills in Alberta from 1970 to 2005 demonstrated, the problem of pipeline ruptures is endemic to the industry. Now with over 399,000 kilometres of pipelines under the authority of the province’s Energy Resources Conservation Board, industry specialists and regulators not only know that this system has never been free from oil spills, but that a spill-free system is an impossible goal. The recent history of pipeline ruptures in Alberta since 2006 further underlines these realities. The alleged rarity of such oil pipeline spills was probably of little solace to the residents and tourists who enjoyed the recreational benefits of life on Glennifer Lake. In mid-June 2008, Pembina Pipeline Corporation accidentally leaked 177 barrels of oil (28.1 cubic metres) into the Red Deer River, eventually resulting in a large oil slick on the surface of Glennifer Lake. While the volume of the spill was considerably smaller than the 2006 Rainbow Pipeline spill, the location of the rupture in a river and lake made this incident more threatening to human lives. As Pembina’s district superintendent Sandy Buchan told the Red Deer Advocate, “Anytime you are putting oil into the river and you are affecting people’s drinking water, you need to take it very seriously.” Pembina instructed local resorts on Glennifer Lake to turn off their drinking water intakes to avoid human consumption of the contaminated water. From June 18 to 27, the company trucked in drinking water to service the community throughout the course of the emergency until the David Thompson Health Region declared the water safe for drinking again. The day after Pembina discovered the oil spill, the Energy Resources Conservation Board once again tried to reassure Albertans about the infrequency of pipeline failures in the province and issued a press release which emphasized that the rate of pipeline ruptures “was at a record low 2.1 failures per 1000km of pipeline in 2007.” This measurement of pipeline failure rate, however, is somewhat misleading in terms of the environmental impact of oil pipeline spills. The ERCB has used the ratio of the number of pipeline failure incidents to the total length of the province’s pipeline network as a metric to illustrate the safety of the system. 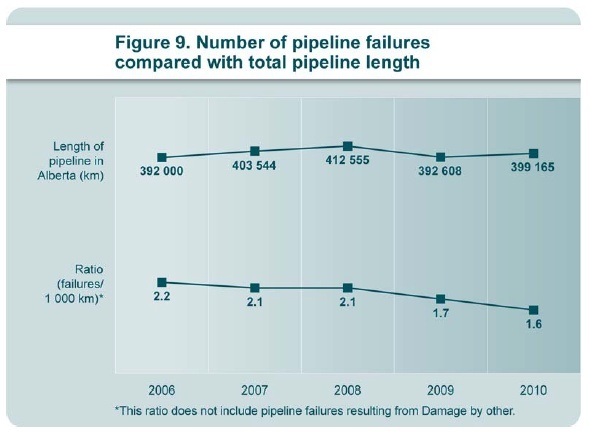 For example, in its 2011 field surveillance and operations summary, the ERCB boasts that the failure rate “was 1.6 per 1000km in 2010.” Furthermore, of the 1,174 liquid pipeline releases in 2010, 94 per cent “had no impact on the public.” This metric for measuring the safety of the pipeline system does not, in fact, measure frequency since frequency is measurement of time, not a measurement of distance. As such, it makes more sense to look at the number of pipeline failures per year. In 2010, there were 20 crude oil pipeline failures and 241 multi-phase pipeline failures (carries crude oil and gas). According to the ERCB, these pipeline failures released 3400 cubic metres of liquid hydrocarbons or roughly 21,000 barrels of oil. If we consider just the crude oil pipeline failures in 2010, there were an average of 1 pipeline failure every 18.25 days. If we include multi-phase pipeline failures, that’s 1 every 1.4 days. The trouble, of course, is that the ratio of pipeline failures to total distance of the network and the vague description of “impact on the public” does not adequately convey the environmental risks of large oil pipeline networks. The environmental impact of oil pipeline spills is obscured under this rubric. The ratio of number of pipeline failures to the total length of the network disguises three important measurements of the environmental impact of oil spills: volume, product type, and location. 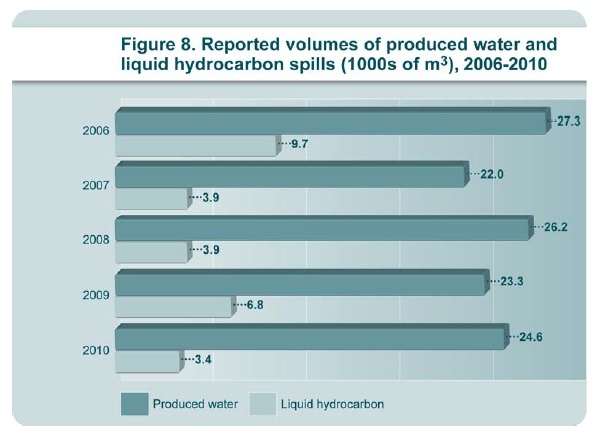 While the rate of individual pipeline ruptures has declined in Alberta since 2006, this rate includes all substances, including water, and does not convey the volume of individual spills. When considered by product type, between 2006-2010 there have been 109 failures on crude oil pipelines and 1,538 failures on multi-phase pipelines, which carry a combination of crude oil and gas. By volume, the quantity of liquid hydrocarbon spills on Alberta’s pipeline network is staggering. From 2006-2010, the pipeline network leaked roughly 174,213 barrels of oil (~27,700 cubic metres). In 2010 alone, more than 21,000 barrels (~3,400 cubic metres) were spilled across the network, nearly the equivalent of the most recent oil spill near Little Buffalo. As the 2008 pipeline failure on the Red Deer River and Glennifer Lake demonstrated, when it comes to the environmental impact of oil spills, it is all about location. Even a relatively small spill in a critical body of water can have enormously detrimental effects on people and wildlife. The cost of cleaning such spills can also vary greatly by location. Unfortunately, the ERCB data from the field surveillance and operations summaries do not include geographic data to assess environmental effects of oil pipeline spills. To keep track of the recent historical geography of oil pipeline spills in Alberta, I have created the following map below. The map includes rough geographic data about major oil pipeline spills in Alberta from 2006 to 2012. The spatial distribution of these major oil pipeline spills reveals, perhaps, why these events so quickly fade from public discourse and popular memory. All but two of the substantial oil spills since 2006 occurred north of Edmonton, away from the province’s major urban centres. As such, most ordinary Albertans have never personally witnessed the environmental consequences of these pipeline failures. The relatively small leak of crude oil into the Red Deer River in 2008 drew a lot of public and news media attention because of its proximity to the city of Red Deer and a popular tourist destination. Similarly, the most recent spill on Jackson Creek is likely to draw considerable attention. Had the May 2012 Pace Oil & Gas spill in northwest Alberta near Rainbow Lake occurred to the south in a more populous (and popular) location, such as Banff National Park, it almost certainly would have attracted greater national media attention. The geography of oil pipeline spills then has political consequences that must also be considered when assessing extension of the pipeline network. A more accurate measurement of the environmental impact of oil pipeline spills should include information about volume, product type, and location. Only then can Canadians understand the environmental history of oil pipelines and reasonably assess future plans to expand the network. Please let me know in the comments if I have missed any major spills on the map below. i wonder whether it would be possible to find similar things for the trans-mountain and other pipelines in bc? Yes, I would like to look into the oil pipeline network in BC. Those pipelines tend to be inter-provincial and are therefore administered by the National Energy Board. I have yet to dig into their annual reports. I’ll probably look into that at some point, especially in light of the Northern Gateway debates. perhaps there is also some way to get in touch with retired employees of the pipeline companies, their contractors, etc.? This is really interesting, Sean, and timely. If you have time, you should consider turning this into an op-ed, in light of this week’s spill. Not a bad idea. One thing I thought about was the number of oil spill clean-up companies in Alberta. While researching this post, I came across several listing for such companies. Thanks for reading the post. Yes, I will try to disseminate this historical data as much as possible. I recorded a brief interview on 660News Calgary this afternoon. Pass along the link to this post wherever you can. Thanks Sean, nice to get all of this information consolidated in one place, and I definitely agree that a clear picture of these spills is incredibly valuable to the public. Thanks for reading this post and please pass the link along to anyone else who might be interested. The industry and their government partners (in crime) never tell us the truth. And you are right about the locations of these spills being far from the beaten path help cover-up the significant damage to the flora and fauna. Reading about the continued after effects of the Gulf spill brings to light how deadly this crude really is. Shameful I’ll be sharing this link with as many as possible and Thank-You! Thanks for reading the article and thanks for passing it along too. Premier Redford’s remarks today really underlined the importance of keeping track of the history of these oil pipeline spills. “It’s actually an exception,” Redford said in regard to the Red Deer River and Glennifer Lake oil spill, “if you think that we have hundreds of thousands of kilometres of pipelines across this province.” The problem, of course, is that her logic obscures the environmental risks of liquid hydrocarbons leaking into critical waterways and the regularity of such spills. Even if just one pipeline rupture occurs along the more than 399,000 kilometre network in a given year, it can still have devastating environmental consequences. And in 2010, according to the ERCB, there were 261 ruptures on crude oil and multi-phase pipelines that spilled roughly 21,000 barrels of oil (~3,400 cubic metres). Yesterday’s spill near Sundre hardly seems exceptional. That is a good suggestion. I’ll look into it. Do you know to whom I would write? I’m with a group called VAPOR (http://www.vaporbc.com/) that is concerned about the hazards and risks of transporting toxic and flammable jet fuel up the ecologically fragile Fraser River estuary to marine terminal and an 80,000,000 liter tank farm on the south arm of the Fraser River and then delivery it via pipeline across Richmond to the Vancouver International Airport (YVR). We want a solution that minimizes the worst case regrets. That is why VAPOR is advocating a pipeline-only solution to existing refineries as a more reliable and safer solution for transporting jet fuel, that has a smaller hazard footprint, compared to using giant Panamax tankers with 60,000 tons of toxic and flammable jet fuel coming from various refineries around the world. A major jet fuel spill, fire or explosion on the Fraser River estuary would be an ecological and public safety disaster. The following table clearly summarizes the relative risk of various modes of transportation. This is excellent information.. As is your report on trans canada pipeline history. Is there a way to correlate human and environmental impact and cleanp costs to these events ? but the data can keep them from lying and misleading others who are open to the truth. Thanks for reading the posts. Regarding the clean-up costs, I had originally hoped to track the costs of these spills over time, but unfortunately I will need access to better records. The sources that I have used, including newspapers and public records from the regulators, do not include this data. I’ll need to look elsewhere. Thanks again for your interest in this research. That is a very good question, but I do not, unfortunately, have an answer. My research primarily followed incidents of pipeline spills and did not investigate the number of fires along pipeline routes. Certainly construction debris and disruption of forests can create a fuel source for anthropogenic forest fires. However, the cleared pipeline routes may also serve as firebreaks. In the 1970s, during the debates over the Mackenzie Valley pipeline project, northern hunters and environmentalists drew attention to the effects of pipeline construction on wildlife habitat, particularly for caribou herds. I am not sure whether or not they found evidence of greater incidents of fires.